Yeah, but: It's supposed to be better than this. The Long Version:The Spadina streetcar has a long history on my favourite street, even though the modern incarnation is less than twelve years old. 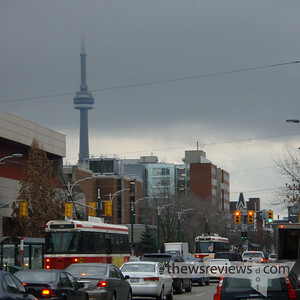 It runs from Spadina Station (reviewed) to Queen's Quay (pr. 'Key'), and then across and up to Union Station. The schedule and map for the 510 can be found here. The streetcar runs along its own private right-of-way, keeping it mostly out of the way of cars, and it uses tunnels for access to both Spadina and Union stations. These were the most expensive parts of the line to build, but gets the multi-million dollar vehicles past some pretty slow interchanges. And after all, isn't reliable and quick mass-transit the whole point of investing money in infrastructure? Unfortunately it isn't that easy, because traffic is a political issue. The city apparently installed 'transit-priority signals', allowing streetcars to control the traffic lights and reduce the amount of time they spend waiting. Unfortunately they were never activated, and cars get to turn left across the intersections before the streetcars are allowed to move. Like St. Clair, the other line that runs on a private right-of-way, Spadina only uses the standard 'Canadian Light Rail Vehicle' (CLRV) streetcars. 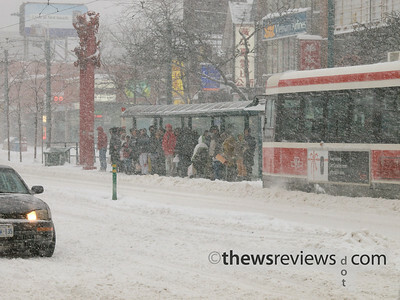 I still remember Spadina before the private right-of-way was built, and it both streamlines traffic and gives the streetcar an advantage in bad conditions. It's not stopped by traffic congestion, or cars breaking down or getting bent in front of it, and the TTC swears that they can't provide reliable streetcar service on any route without one. But even though it theoretically provides an extra measure of reliability to the service, the scheduled speed of the neighbouring 511 Bathurst streetcar is actually faster than the 510 Spadina car. On the other hand, it does give emergency vehicles a great way to cut through traffic. Most of the streetcars turn back at King street, allowing more cars to serve the more popular Chinatown - U of T portion of the route. But the choice of King as the turn-back point leads to some difficulty at that intersection, which is busy to begin with even before the 510 streetcars start turning on and off of it. Streetcars bunching up and creating gaps in the service is the big problem on the route, so this isn't a great start. 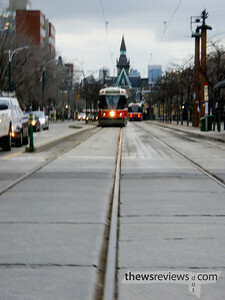 The limitation on streetcars is that they're on rails, and can't pass each other. When one gets full, it slows down. It takes longer to load and unload at each stop, and as the gap in front of it widens, more and more people are waiting at each stop. The design of the platforms, with narrow walkways and protruding shelter supports, makes loading and unloading even worse as two directions of passengers try to get past each other. Eventually three or four streetcars will be running close together, and the service goes down the tubes. This is a problem that isn't likely to go away until the TTC gets higher-capacity cars, because the route routinely overloads the current vehicles, and there's a practical limit to how many can be added. 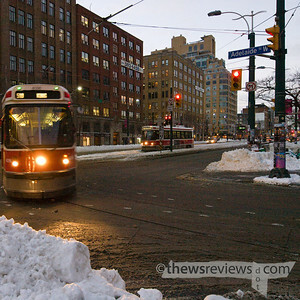 The photo at the very start of this review says it all: shot an hour after the evening rush, these CLRVs are only one stop south of Spadina station, and they're both packed. Of course, a cynic might point out that the TTC already has larger vehicles, the extended ALRV ('articulated light rail vehicle') streetcars that serve many other routes. 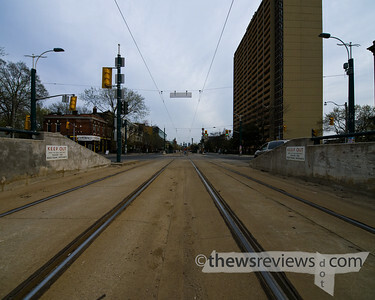 They're not used on Spadina because they're too long to safely run through the Union loop. Deducing how that problem will be resolved by a new generation of longer streetcars is an exercise for you, dear reader, because I can't figure it out. Most of the stops are 'farside stops' which means that they're on the far side of the intersection. In some ways this is good, because it makes streetcar movements more predictable to drivers. It also slows down the route by making many streetcars stop twice. If I was in charge of the street design, there are two things that I would like to see. 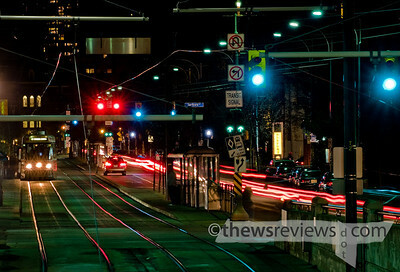 One is real transit-priority signals, and they're needed throughout the downtown core. There's no reason why a streetcar that's loading or unloading should be facing a green light, and no reason why one that's ready to move should be stopped by a red one. It would improve speed and safety for everyone, including private cars. The other thing that I would change is adding near-side platforms to key Spadina streetcar stops to be used only for unloading at the driver's discretion. The first streetcar in a chain could unload passengers while facing a red light, and then load passengers more efficiently at the far-side stop. The streetcars following could do the same instead of waiting for the first car to clear the platform. But here's the key bit: the first car could skip the loading platform altogether and continue up the line. This puts a less-crowded car in front, closes some of the service gap, and the passengers left waiting at the skipped stop will be quickly picked up by the following car. It's not fun to be skipped when waiting forever for a streetcar, but it's a routine fact of life on the Spadina route already. This would just let it be predicable and apply to the stops that need it most. Of course this will never happen, because the unloading platform would take away the left-turn lane at Dundas and College streets, and possibly at other key stops as well. I'm not convinced that private automobiles have the inalienable right to turn left, especially when it blocks city-owned streetcars that cost millions of dollars each and can take a hundred cars off of the road, but that's just me. Most people wouldn't agree. 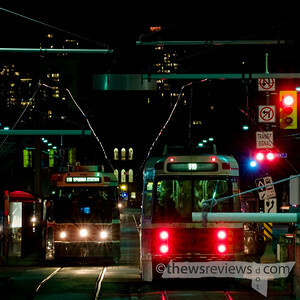 For a really brilliant selection of articles and comments on the Spadina streetcar, and Toronto transit in general, Steve Munro's Web Site is a must-read.